When it comes to fire-extinguishers it’s important to have the right one on-hand for the particular type of fire, and also to know how to use it safely. In some instances, using the wrong type of extinguisher on a fire could be dangerous and increase the risk of damage and injury. Class A – wood, paper, plastic, furnishings, textiles and rubber. Class B – flammable and combustible liquids (e.g. petrol, oils, solvents, kerosene). Class C – flammable and combustible gases (e.g. LPG, methane, butane, propane). Class D – metals (e.g. aluminium, sodium, magnesium). Class E – electrical equipment. Water (A) – suitable for Class A fires only. Coloured red, no band. Dry chemical powder (ABE) – for Classes A, B, C & E. Coloured red with a white band. Dry chemical powder (BE) – Classes B, C, E & F. Red with a white band. Carbon-dioxide (Co2) – suitable for Class E, with some limited application for Classes A and B. Red with a black band. Foam – suitable for Classes A and B, and may have some limited use for Class F. It is coloured red with a blue band. Wet chemical – Classes A and F. Red with a beige band. 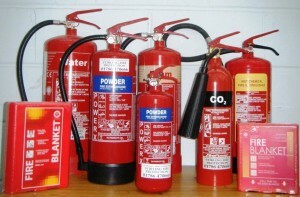 Vaporising liquid – Class A and E, and some limited use for B and C.
Note that Class D fires (metal) require special fire-equipment and a fire expert should be consulted for more information. Fires can be extinguished through cooling or smothering. Water and foam are best used for cooling, while foam, Co2 and dry chemical are used for smothering. Aim low, by pointing the nozzle towards the base of the fire. Squeeze the handle – this releases the fire-extinguishing agent. Sweep from side-to-side at the base of the fire. Other equipment includes fire-blankets which may be used for Classes A and B and small kitchen fires through smothering, and hose-reels which use an un-metered water-supply. The equipment listed above should only be used on small fires, and only if safe to do so. For more information and / or to train your employees or volunteers in the use of fire extinguishers, go to the Training section on the website. For more tips on church fire safety and risk management, see our articles on fire prevention and the RedBook risk program, or get in contact with the CCI office. I had no idea that there were water fire extinguishers. I have never had to use one before, but I do know how. I will have to see what type of fire extinguisher my work has.